The condition of former Israeli Prime Minister Ariel Sharon, who has been in a coma since suffering a stroke in January, has deteriorated though there was no immediate danger to his life, hospital officials and former aides said Sunday. Sharon, 78, was having a problem with his kidneys at Sheba Medical Center in the Tel Aviv suburb of Tel Hashomer. Hospital officials also said brain checks had shown changes in Sharon's brain tissue, but gave no further details. "Over the past two days, the condition of the former prime minister has deteriorated. His kidney function is worsening and he's amassing liquids in his body," the hospital said in a statement. Two of Sharon's former aides, who said they spoke to his son Gilad, said there was no immediate danger to the former leader's life. The former aides spoke on condition of anonymity because they were not authorized to speak to the press. Hospital officials confirmed by phone that Sharon's kidney function was worsening, that his body was accumulating liquids and that his brain tissue had undergone changes. They said doctors were conducting additional checks to determine what caused the change in his condition and how to treat him. Israel's Army Radio cited medical experts as saying this type of deterioration is not uncommon for people who have been in a coma for such a long time. Sharon, Israel's most popular politician, had a small stroke in December and was put on blood thinners before he suffered a severe brain hemorrhage in January. The Israeli leader underwent several, extensive brain surgeries to stop the bleeding, and many independent experts doubted that he would ever recover. The last surgery on Sharon, in April, was to reattach a part of his skull, removed during the emergency surgery to reduce pressure on his brain. The reattachment was described as a necessary step before transferring Sharon to a long-term care facility. Experts have said Sharon's chances of ever waking up after his massive stroke in January are not good. Sharon personified Israel's military might for decades, and Israelis were stunned to see him felled by illness. His stroke came after Sharon saw through his contentious plan to withdrawal Israel from the Gaza Strip after 38 years, and just two months after Sharon shook up the Israeli political map by bolting his hard-line Likud Party to form the centrist Kadima faction. 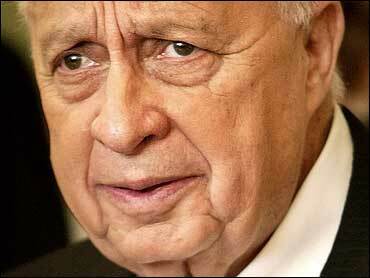 With Sharon as its leader, Kadima was expected to easily win Israeli elections. After the stroke, Sharon's successor as party leader, Prime Minister Ehud Olmert, led Kadima to a slim victory in a March 28 vote.